Doing a real travelogue in the brief space that I allow myself for “Missives from the Art World” is not possible. So think of these as my thoughts on why I (and many art dealers) travel. It is the first time in a very long time that I can say that I am a tourist in every way in my current venue, St. Petersburg, Russia, I am neither trying to buy nor to sell nor visiting clients. Though I must admit to always thinking what could this or that museum be interested in that I might have or have access to. I came here for the simple reason that I wanted to see a city I had never been to and discover for myself the art I had heard so much about. It is really quite amazing in every respect. Firstly, it is easy to see why they call them white nights. It is daylight for 24 hours a day. It is difficult to decide if it is bed time or not; at this time of year even street lamps are unnecessary! Since I am just a tourist on this visit I did not get in touch with any curators or directors before coming. In art I am privileged and spoiled, and unused to waiting in line. 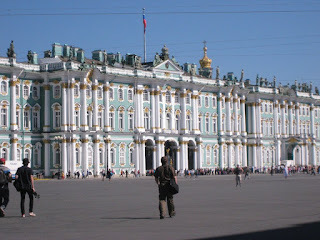 The longest of the lines I waited on during my stay here was at the Hermitage. That took two hours. 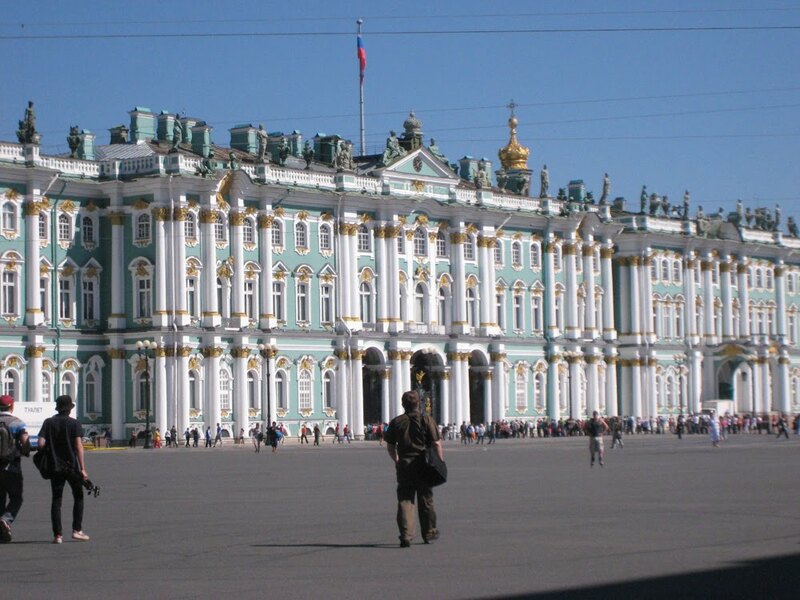 I have never seen so many people in one line and, yet, they all get gobbled up by the massive Winter Palace. It is said that if you spent a minute looking at each work of art in the collections it would take eleven years to see them all! But there is no question there are untold treasures, a couple of paintings by Leonardo da Vinci, a room full of Rembrandts, gallery after gallery of important 17th and 18th century French paintings collected by Catherine the Great when they were “contemporary art”. I could go on for a page or two just listing categories and artists. There are more grand palaces in St. Petersburg than anywhere I have ever been, some restored and others turned into office buildings. Outside of town there are still more to visit but I only had time to see a couple. 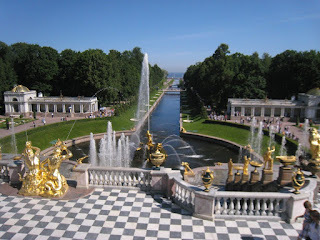 At Peterhof, more than the palace itself, I found the fountains an incredible sight. Peter the Great wanted to build a palace that would be every bit as good as Versailles and even surpass it. In the gardens and fountains I think he succeeded. The unexpected and strongest impression left by my visit was the revival of the cathedrals and the churches. It is as if all this religious fervor that had been pent up for so many years under Communism burst forth with Perestroika. I saw many extraordinary churches and cathedrals that have been restored and are now in active use. The most extraordinary is the Cathedral of Our Lady of Kazan built by Andrey Voronikhin and started in 1801. I was there at the time of a service. It was quite an experience. The organ was playing, the choir was singing and many of the faithful were buying and lighting candles. It was hard to believe that in 1932 the Cathedral had been turned into the Museum of the History of Religion and Atheism. Things Change! Another, the Church of the Savior on Spilled Blood which was begun in 1883 by Alexander III in memory of his father Alexander II who had been assassinated on that spot. It is most extravagant in its decoration and all the interior walls are covered in mosaic. The Peter and Paul Cathedral, located inside the Peter and Paul Fortress, is the oldest landmark in St. Petersburg, dating from 1712. It seems to have a foot in both Communist and Post-communist eras. In 1924 it was turned into a museum which it remains today, with paid admission, even though religious services have been held there since 2000. The experiences of travel provide a “post-graduate” education to anyone involved in the art world.